Planthoppers are related to aphids and the nymphs are sometimes mistaken for woolly aphids. However, planthoppers … hop. Aphids just mosey around. The nymphs of several planthopper species cloak themselves in a dense tangle of waxy, white "fluff." They congregate in groups, or "colonies," and their profusion of flocculent material on affected plant stems and leaves draws attention to the insects. The nymphs also produce copious quantities of honeydew which may coat the plant and become colonized by black sooty molds. Planthoppers usually have little impact on the overall health of landscape plants and seldom become more than a nuisance pest. 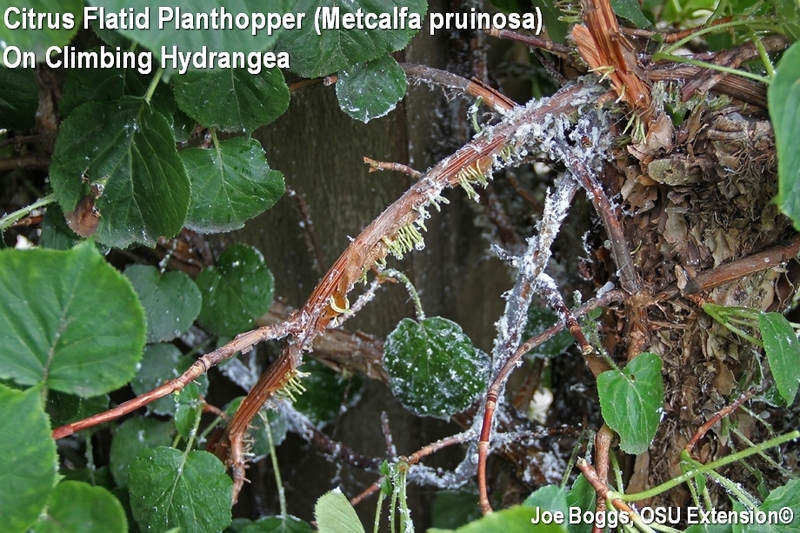 However, in recent years, I've watched a recurring infestation of citrus flatid planthopper (Metcalfa pruinosa) appear to cause noticeable damage climbing hydrangea growing on an arbor in a county park. The most heavily infested plants have sparse canopies and new growth has been stunted. Planthopper nymphs can be killed with insecticidal soap applications which will also wash away the "fluff," or by using a standard insecticide labeled for use on the host plant.